If you’ve ever been to a trade show before, you know just how hectic it can be. 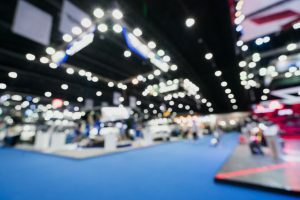 With large crowds of people, vendors and competitors at every turn, and plenty of marketing opportunities, preparing for and attending a trade show can be exhausting and stressful. It can be difficult to know the best way to stand out among the crowd; luckily, there are a few simple ways to ensure you make the most of your trade show experience. Here are some tips for your integrated marketing exhibits at your next trade show. Pick the right trade show: The easiest way to stand out is to make sure that you’re going to the right trade show for your business. Picking the wrong show to attend can end up being a waste of time and money for you. Make sure you pick a trade show large enough to actually get the attention of a decent number of people; about 50% of the largest 200 shows in the USA take place in Las Vegas, Chicago, and Orlando. Have your promotional materials ready: If you’re attending a trade show, you’ll want to have your business swag and giveaways ready to go, and plenty of them. Make sure you have a rough idea of how many people might stop by your example exhibit booths so you don’t run out of promotional items, since promotional items are one of the most effective ways to ensure people remember your brand. Use digital displays: By having video walls and digital displays involved in your integrated marketing exhibits, you’ll make a stronger visual impact than your competitors. Banners can be helpful, but digital displays have more functions, potentially even including physical interaction. If your potential customers are able to interact more directly with your exhibit, rather than just seeing it as they pass by, they’re far more likely to commit your brand name to memory. Looking for a bit of assistance in preparing for your next trade show? Exposyour can help you get set with your promotional items, digital displays, and other components for your integrated marketing exhibits. Contact Exposyour today for more information on how to improve your trade show marketing tactics.